When Geneva Deck collaborates with you, the possibilities are endless. From creating straight runs and 45° runs, 90° “L” shapes to “U” shapes, and galley kitchens, our experienced carpenters can build the shapes that exist in your mind and add the amenities to fulfill your vision. We offer over 400 cabinet sizes and can accommodate almost any kitchen layout or challenging footprint. Every component of your kitchen is inspected, doubled checked and validated to be in perfect condition prior to shipping, and upon delivery. Our desire to have satisfied customers insures careful attention to detail, and you can rest assured that we will design and deliver a unique signature kitchen for your outdoor living room. Isn’t is wonderful to store your cooking supplies, dishes, glassware and food supplies where you use them? 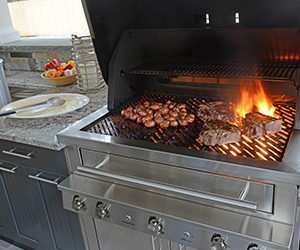 Geneva Deck is proud to offer superb Stainless Steel Cabinetry to fulfill your outdoor kitchen needs. These cabinets are durable, have weather resistant finishes and a maintenance free protective coating. They are easy to clean, and built to last… and come with a lifetime warranty! Geneva Deck considers every project to be our most important – no matter how large or small. Our designers work with you throughout the entire process to bring your custom outdoor kitchen to life, from initial design to shipment and installation.